Day 246: General findings of fault, maybe. Specific injuries unproven. Today Mr. Guy Pratte completed his four-day presentation of the final arguments for his client, JTI-Macdonald. It was a fast-paced exercise. His focus was on the methods that had been used to count the number of smokers whose disease could be attributed to tobacco use, and proposals to identify smokers who are addicted. And, in case all of his arguments over the week had not hit home and Justice Riordan did not dismiss the claims against his company, he also challenged the plaintiffs' proposals for the amount that should be paid, and how it should be disbursed. "You can't reduce all individuals to one single number"
From a public health perspective, the approach taken by the plaintiffs to assess the number of smokers whose lung cancer and other diseases are related to smoking is fairly straightforward. They asked epidemiologist Jack Siemiatcyki to calculate the number of cigarettes that would have to be smoked before it was more likely than not that tobacco was the cause of any individual's disease. The cut-off point he calculated of 36,500 cigarettes, or 5 pack years, was subsequently built into the revised class definition. Mr. Pratte has hammered home the many legal reasons he thinks this approach is flawed -- chief among which seems to be that it lets the plaintiffs sidestep the job of showing the connection between any individual's disease and any actions of the company. "It's true that statistics and epidemiology have been used in courts before - but never has it been deployed in courts to establish specific causation." He repeated his concern that people, like himself, who had quit smoking more than 30 years earlier had a much lower risk profile, but would still be considered eligible for damages if they came down with lung cancer. The result, he said, was that Mr. Siemiatycki's results were not reliable enough to hang a decision on. "If one proposes a method which fails the measures that statistics has evolved to ensure reliability, it can't be used by this court - regardless of what section 15 says." He explained to Justice Riordan why these problems could not be fixed by setting a higher critical amount, or by averaging an award across a population. Mr. Pratte said that although lung cancer might be responsible for 80% of disease, the Supreme Court would consider it wrong to give each lung cancer victim 80% of a damage award. By the number of times he referred to it, a ruling about the slander of immigrant taxi-drivers by a right-wing radio host (Bou Malhab) is a key plank in Mr. Pratte's defence. The plaintiffs proposal for nicotine addiction to be defined by daily smoking over a period of time was also accepted by Justice Riordan as a way to define eligibility for the Létourneau addiction class. The class definition arrived at does not require a medical diagnosis of addiction, but it does require that someone be a smoker on at least three occasions separated by a decade. (Have smoked before 1994, be a daily smoker on September 1998 and be a smoker on February 2005). The plaintiffs calculate that about 900,000 of Quebec's 1.6 million smokers would be qualify (i.e. 52%). Mr. Pratte rejected this or any other self-assessment tool as a way of measuring addiction. "It cannot be that addiction or dependence is ascertained simply by self-reports of 'I can't quit or by a mechanical 3 or 4 year rule," he objected. Instead, he proposes that the measure of addiction be established through individual assessments under the DSM tools for tobacco use disorder. It was this approach, he said, that was used in clinical settings by the psychiatrists who had testified (both Dr. Negrete and Dr. Bourget). It was not true, he said, that anyone who was addicted to cigarettes was not able to quit. He cited Health Canada's advice to smokers that "with the right combination of practice, determination and support, you will be able to stop smoking for good" as support for his view that it came down to a question of willpower. "There is a huge voluntary element in that." During the short afternoon session, Mr. Pratte turned to the issues of how much money might be assessed against the companies should Justice Riordan arrive at this point in a judgement. While the plaintiffs have calculated the compensation on a per-capita basis, they are asking for it to be levied against the companies as a lump sum -- a collective recovery of damages assessed on an aggregate basis. Given his insistence that the impact of his company would vary among different individuals, it was not surprising that Mr. Pratte opposes collective recovery. "The damages sought against JTIM are wildly exaggerated for a host of reasons, principally that there is no way for you to arrive at a number of total class members in either class about which you can be sufficiently certain that it is accurate." The Conclusion: "It just won't write"
Mr. Pratte's prefaced his closing comments by referring to the Chief Justice of Canada's Supreme Court, who said that sometimes decisions got changed during the process of writing a ruling. The judges were "leaning a particular way and when they sit down to write the reasons, they found that it 'it just won't write.'" He said that even if the judge wanted to find the companies guilty, he would not find a lawful way to do so. "I don't know which way you are leaning, but based on the law you cannot get to the result [the plaintiffs] are urging on you." He identified the roadblocks to such a decision: the absence of a risk/utility doctrine in Quebec, the failure "to connect any fault to a harm on a class member", the historical context in which actions would have to be judged. He recommended that Justice Riordan follow the path of the Florida Appeal court when it broke-apart the Engle class action into individual trials. "You could make general findings" about the dangerous or addictive nature of cigarettes, or about specific faults at specific times. These "could be used in individual trials by those who could prove injury." This, he said was "the farthest you could go by respecting the law and the facts here." As Mr. Pratte finished, Justice Riordan acknowledged the physical and mental energy that would have been required to stand for four days and summarize 1,000 pages of argument. "You must be exhausted." If so, Mr. Pratte did not show it. His stamina is to be envied - I was only an onlooker, and my brain was fried. I have been wondering this week how Imperial Tobacco could fill the 8 days it had scheduled without risking irritating repetitions of what has been said by the other two companies. Ms. Suzanne Côté rose at the end of the day to say that the company would need only half the time originally scheduled. The details of the abridged schedule are to be worked out. The trial will resume on November 12th, when the final arguments for Imperial Tobacco will be presented. Day 245: Anodyne advertising. A failed conspiracy. During this stage of the Montreal tobacco trials, my shortcomings have stood in the way of my fully appreciating the events that I have the pleasant task of witnessing. Chief among those, of course, is my poor understanding of the legal principles that are so vigorously and contradictorily thrashed out before Justice Riordan. Fin de non recevoir, anyone? Like a sophomore arts major who has stumbled into a graduate physics lecture, I often sit in blank incomprehension. Today, however, was a return to the familiar. On his third day of presenting the final arguments of his client, JTI-Macdonald, Mr. Guy Pratte turned to the subjects of cigarette advertising and industry collusion. Home turf at last. But what a different landscape Mr. Pratte made of it! Over the morning, Mr. Pratte presented Justice Riordan with reasons he should not find that the advertisements placed by JTI-Macdonald offended either the community standards of their time nor Quebec law. He focused at first on the ads produced during the first decades of the trial period, before 1980. Until his death at the end of the 1960s, Macdonald Tobacco was a private company owned by the philanthropist-industrialist, Mr. Walter Stewart and his family. He will be remembered as the man who gave most of profits away, and who did not put much store in marketing. (Despite this approach, the company's bread-and-butter brand, Export A, was the market leader. Shipments to soldiers during the Second World War cemented the brand's popularity, but this mixture of patriotism and marketing happened prior to the years covered by this trial). After showing a few dull ads from this period, Mr. Pratte then showed the next phase of Export A ads, which were published in the mid 1970s to mid 1980s, after Mr. Stewart had died and the company had been acquired by RJ Reynolds. RJR-Macdonald, as it was then, was struggling to establish its marketing relevance and its ads showed it. Men with dogs. Men with trucks. Log-drivers taking a break. Rumpled, domesticated men. Canada, eh? Mr. Pratte asked rhetorically how these ads could possibly appeal to youth, or convince a smoker to not quit. "How more anodyne can you be?" These were a form of lifestyle advertising, he said, but no one raised concerns about lifestyle ads in this period. "There were no complaints from anybody." Lifestyle ads, he told Justice Riordan, were not banned until near the end of the class period -- 1997! He warned him against ruling that such ads were inappropriate. 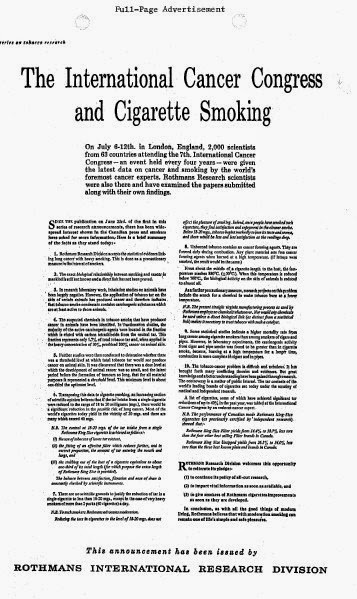 Doing so would be to "retroactively impose a ban on advertising." The "smoke smart" ads for low-tar Vantage were similarly portrayed as consistent with federal health policy. Yes, there may have been a few complaints at the time, but these had come to nothing. "You can't ignore the fact that the ads, when you look at them, do what the government wanted to be done. You can't ignore that the complaints were dismissed," said Mr. Pratte. Moreover, the people who saw these ads were aware of what was being promoted (cigarettes) and were aware of the risks of using buying them. They were not "empty vessels". "If there is one thing we know about these people is that they have this one piece of knowledge, as of 1980." Because of this, the approach taken by the Supreme Court in protecting consumers from sweep-stake ads for magazines did not apply. In the 1980s, the management and marketing departments at RJR-Macdonald were given a shake-up, and the new teams adopted a more vibrant marketing style. Mr. Pratte displayed a few of these ads, and explained that the change reflected the business pressures on the company to maintain market share. He said these ads had everything to do with brand preferences and nothing to do with encouraging people to smoke. It was at this point that Justice Riordan put the first of a series of wicked questions that would face Mr. Pratte over the day. "So what is the point of having rafting then?" Justice Riordan suggested that the marketers knew what they were doing and that a connection to smoking might be inferred by their choice. "If they go to all this effort to take a wonderful picture of a kayaker ...."
He pointed out that by opining about and interpreting ads without further proof of impact, Mr. Pratte was doing exactly what he had criticized the plaintiffs' expert marketer, Richard Pollay, for doing. Mr. Pratte insisted that the ad served "only to change the image of the brand .. it does nothing except attract attention." He turned to an explanation of the many ways in which the company had acted vigilantly to ensure it was not targeting youth in its marketing. It certainly did not, as the plaintiffs alleged, purge its records of references to young people -- it's just that there weren't very many! He outlined other ways in which the company had acted responsibly to guard against exposing young people to inappropriate marketing. * They had pulled ads for Tempo cigarettes very soon after there were complaints (Exhibit 670). * They measured the audience for down-hill skiing, and found that it was mostly adults, thus allaying concerns about reaching youth through broadcast of sponsored ski events. (Exhibit 40388). * They gave the Minster of Health an opportunity to review an their guitar ad before launching their first legal campaign after the striking down of the federal ad ban. (Exhibit 40406). "There was no response from the minister saying 'please don't run that'." By this point the gap between what I believed to have happened and what Mr. Pratte was asking Justice Riordan to believe was growing quite wide. * Minister Dingwall had objected to the guitar ad. (Exhibit 11541.26.138.121). The second half of the day was given over to Mr. Pratte's answers to the sixth question posed by Justice Riordan in his guidelines for the final arguments: Did the company conspire to maintain a common front in order to impede users of its products from learning the inherent dangers of such use? Not possible to find conspiracy, said Mr. Pratte. Proof lay in the fact that neither the public nor government had been tricked. "Government was not deceived. They did not accept the position of industry," he said. "It was a massive failure if it was ever a conspiracy." Justice Riordan gave Mr. Pratte even less comfort this afternoon, forcing him to step back from a few claims he wanted to make. The first was after Mr. Pratte suggested that that the tobacco industry had established its first political association in response to a request from the Minister of Health in 1963. (Exhibit 20326) "But wasn't there another document?" the Judge interrupted, getting confirmation that this had later been described as an "insurance policy" of the industry. (Exhibit 938). (The judged politely rebuffed two attempts to disconnect the two exhibits). The judge also challenged Mr. Pratte's characterization of Macdonald Tobacco as "bystanders" to an earlier (1962) meeting to discuss a united position on smoking and health issues. (Exhibits 154, 154a, 154b, etc). He asked the lawyer to acknowledge that "they were a member, they never disassociated themselves" and then, most unusually, instructed him to move on to a new topic. He solicited Mr. Pratte's views on the role of conspiracy within civil litigation in Quebec. What if the CTMC had acted improperly? Would all the member companies be implicated? It would have to be wrongful behaviour, said Mr Pratte, before admitting that this would be the case. Part of the allegations against the companies is that they conspired to engage scientists to muddy the waters and maintain a false controversy. "Unfair", "over-the-top" and "unwarranted" said Mr. Pratte, to suggest that prominent Canadian scientists who had been funded by the industry had done anything improper. He singled out two Canadian Medical Hall of Fame inductees -- Peter Hogg and Hans Selye -- as examples of individuals whose reputations should not have been brought into question. Mr. Pratte said Mr. Selye had told the committee that he did not have a history with the industry. "I should like to start by making it clear that I have no special competence to talk about the dangers of tobacco since I have done no research with tobacco products." Only recently, he told them, had he been able to"convince the Tobacco Industry to provide funds for research"
"One has to be fair," said Mr. Pratte. Dr. Selye had been "open about the financial contribution and the limit of his testimony." What an odd poster-child for academic integrity! As detailed in an article in the American Journal of Public Health, Hans Selye's involvement with tobacco companies and their litigation efforts dated from a decade before the Isabelle Committee. In 1959 He produced two memoranda on "the alleged relationship between cigarette smoking and lung cancer" (You can find the first and second in somewhat garbled form on the Legacy site. His role was hushed up: in 1959, he advised U.S. lawyers that he did not want his name used in association with this work. None of this interesting material is in evidence in this trial. The record does, however, include an April 30, 1955 newspaper article identifying him as a University of Montreal researcher looking into tobacco and cancer. (Exhibit 1541.08.039.012). Mr. Pratte is a highly articulate lawyer, and my vocabulary has been enriched by the experience of listening to his presentation. This is a man who does not provide an outline, prefering instead to "adumbrate"! Most useful was my introduction to a French expression that does not seem to have a direct English equivalent. A "procès d'intention" is the condemnation of someone on the basis of their alleged intentions. Guarding against such a "procès" was a recurrent theme in Mr. Pratte's comments this week. His closing remarks today were another appeal to the judge to make a distinction between the moral qualities of the defendants and their legal status. "You may have decided that these people are bad people. But that is not enough. You have to link it to the injury. The injury could only be linked [to conspiracy] if people had actually been deceived. ... It was a massive failure if it was ever a conspiracy. My friends are inviting you to see a conspiracy that just doesn't exist." Tomorrow Mr. Pratte will complete his presentation of JTIM's defence with a discussion of causality and punitive damages. The second day of Guy Pratte's presentation of the closing arguments for his client, JTI-Macdonald, was much as he promised: a speed-reading of the detailed (940 page!) brief that was submitted to Justice Riordan about a month ago. The focus today was on the response by JTIM to the questions posed by Justice Riordan about knowledge of the harms of smoking, on the company's public statements about those harms, and the efforts undertaken towards the development of a safer cigarette. Not surprisingly, his comments lined up tightly with the legal argument he had presented yesterday, and which he said should restrain Justice Riordan from finding that his client had caused any harm to which legal liability could be attached on a class-wide basis. Today was the first day that a defendant company had presented its views on "the proof" (Mr. Potter, who presented the defence for Rothmans, Benson & Hedges earlier this month, had not commented in much detail on the testimony and exhibits that establish facts.) In this first airing of the companies' version of events, there were clearly different tellings of the story. You say tomato. I say Swiss cheese. Justice Riordan had asked each party to answer the questions of when did the public, the government, the public health community and the companies "know about the health risks associated with tobacco use." At the time this outline was offered, JTIM's team had expressed their concerns -- and today it was clear that even six months later they do not like the way these questions are framed. It does not matter when the company knew, they say. It does not matter what people knew or believed. It only matters whether they were AWARE that such issues were being talked about. In JTIM's view, for the past 5 decades or more class members "were or ought to have been aware of serious risks and dangers of smoking ... including that smoking may be difficult to quit." Once aware, the decision to take the risks or not was properly that of the smoker. 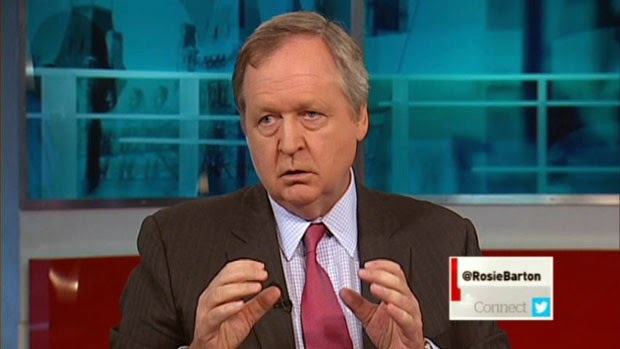 To support his view that smokers were aware, he pointed to government actions to advise Canadians about the health risks and to news stories about those risks. He seemed to put a great store on two Health and Welfare publications on smoking - one from 1940 and one from 1964 (Exhibits 40346.20 and 40123), and noted that after 1963 the government was satisfied with level of awareness. At this point, he said, the government's strategy and actions evolved towards dissuading people from smoking: a whole different kettle of fish. His review of the media coverage was reminiscent of the presentations by their expert historians, Jacques Lacoursiere and David Flaherty: a series of news story headlines flashed over head. "Virtually every time you opened the newspaper or turned on TV" you were likely to see a report on the health risks of smoking, he said. On the basis of these news-stories, the historians were reasonable to conclude that there was widespread awareness, said Mr. Pratte. And the polling results from the period supported this conclusion. While not conceding that it mattered whether people believed that smoking caused disease, Mr. Pratte argued that the evidence showed that they did. He pointed to the plaintiff's claims that a large percentage of people did not agree with statements about causation to turn the numbers around. Not reasonable to say that 1 in 5 did not know, if one could equally say that 80% did know. Again, he drew a line in the temporal sand, stressing that levels of knowledge were higher when the Consumer Protection Act was in force (after 1980), and therefore it would be unreasonable to presume that smokers were not in possession of health information missing from cigarette advertisements. As Mr. Potter had done earlier, Mr. Pratte pointed to Mr. Viscusi's studies as proof that Canadians overestimated the harms from smoking. (Justice Riordan has read and ruled on Paul Slovic's report that repudiates this study, but this is not in evidence). The plaintiffs must prove that everyone was not aware. They didn't. Reinforcing his argument against a collective award, Mr. Pratte said the Judge could not conclude that the "entirety of the class" was in a position of not knowing. It is "undeniable - beyond dispute, beyond argument - that a huge majority of people believed in the very serious risk of tobacco, including youth." He applied a similar analysis to the issue of addiction. All class members were, or should have been, aware that it is hard to stop smoking, and they were aware before they started to smoke. The health warning messages on Canadian cigarettes have, for most of 40 years they have appeared, been attributed to the Health Ministry (now Health Canada, formerly National Health and Welfare). Mr. Pratte refuted the plaintiffs' position that the refusal of the companies to make direct statements about health risks was a factor the judge should consider. "There is no evidence in this case that unattributed warnings would have made a difference." Justice Riordan challenged his position that "Mr. Munro had no difficulty with the attribution that was settled on", recalling that the evidence showed the government's preference for attributed warnings. Mr. Platte responded that the government "had a stick that no-one else had" and that they "always had the last word." Everyone was aware -- even ahead of a scientific consensus. There were a few occasions during today's speed reading that I think I lost sight of the plot line. One of those was when Mr. Pratte took exception to the plaintiffs' statement that a scientific consensus had emerged during the 1950s about lung cancer's causal relationship to smoking. Had he not just spent the good part of the morning arguing that everyone knew? But no, it would appear that JTIM's defence also claims that the government was ahead of the medical community as a whole in 1963. And they were certainly ahead of the company. "There is not not an iota of evidence that JTIM knew anything more than the government of Canada before 1974 or after. What you have is massive awareness and belief in the class period, no evidence that JTIM knew any more, and crucially no evidence that an earlier or different warning would have made any difference to any, let alone all class members." Mr. Pratte showed a series of statements made by executives of Macdonald Tobacco, RJR-Macdonald and JTI-Macdonald, and said that, barring an inadvertent omission, this was the entire record of communications on smoking and health. In doing so, he discounted each one. A privileged statement (made before parliament). A comment to a health agency executive, who was unlikely to be misled. Comments to employees, unlikely to be read outside the company. Statements made about a program that never ran in Quebec. This was not enough to conclude that the company denied the health risks, he told the judge. "The 10 minutes it took me to go through that statement - even if I missed a few - cannot amount to a grand denialist campaign from 1950 to 1998." Low tar cigarettes, compensation and hole blocking. Mr. Pratte moved mercifully quickly through the long trial record of federal government actions aimed at reducing the amount of tar and nicotine in cigarettes. The genesis of this idea came from the health community, and was led by government. He reminded Justice Riordan of the beliefs of MAH. Russell and others that tar levels in cigarettes should be reduced. He cited from the testimony of former Health Minister Marc Lalonde, to the effect that it had indeed been a goal of government to move smokers to these products. A criteria set by government (not the companies) was that the result of product modification be "a product that users would use". This is why a nicotine-free cigarette was not developed. "That was the government's own conclusion - that there had to be some nicotine in those products otherwise smokers would just go back to their original brands." The companies never concealed knowledge about compensation, and it was the government which first identified it as a possibility. But even with compensation, "overall there was the conclusion that there was some benefit" to having lower-tar cigarettes. To these ears, it sounded like an admission that JTIM manufactured cigarettes that allowed for the ventilation holes to be blocked when he minimized their impact. "The popularity of these brands declined during the class period -- you can't say people became addicted as a result of these cigarettes." Tomorrow Mr. Pratte will respond to the allegations that JTIM improperly marketed its cigarettes and that it conspired with the other companies. Over the first two years of this trial I came to the view that part of JTI-Macdonald's strategy was to be nicer in the courtroom than their co-defendants in the Montreal tobacco trials. While not exactly deviating from the companies' united position, there have been many small and not-so-small ways in which it has been made known that this legal team is more willing to observe court-room niceties and professional courtesies than were the legal teams representing the other two companies. If I ever caught Mr. Guy Pratte or his Borden Ladner Gervais team-mates (Francois Grondin, Kevin LaRoche, Patrick Plante) or tobacco trial veteran Catherine McKenzie let their decorum slip, I no longer recall it. Today, however, Mr. Pratte seemed to drop any ambition for the Miss Congeniality award. He was caustic (about the unusual absence of a member of the plaintiff's team). He was derisive (of the moral qualities of a former client). He was almost chippy (in response to a clarification about what sounded like a minor slip-of-the-tongue). He was a man with a new script. Literally. Mr. Pratte was obviously reading from a prepared text - something I have rarely seen in this courtroom. He didn't do so with his customary level of smooth. In the observer section were about a dozen new onlookers as well as the regular Japan Tobacco team boosters. Was he playing to that audience instead of Justice Riordan? No feigned moral outrage. Only propositions. Mr. Pratte opened what will be a four-day presentation of a 1,000 page written argument with a litany of insults that had been levied against his client during the trial. Tobacco companies had been called "murderers" and "parasites," he recalled, and their lawyers denounced as "accomplices." He told Justice Riordan that it was the "passion" of the plaintiffs, and not facts or legal principles that was driving this trial. "The plaintiffs want to you to condemn the defendants because they despise the tobacco companies." But in condemning the plaintiff's lack of detachment, perhaps he gave a glimpse of his own ambivalence "In a court you only submit propositions, You don't think them. You aren't convinced of them. .. Court rooms are not there to voice one's personal beliefs -- neither mine nor theirs. We are in a court of law, not a court of public opinion or parliament where feigned moral outrage passes for discourse." For the remainder of the day, Mr. Pratte elaborated on his own propositions about the weaknesses in the plaintiffs' case and the reasons why Justice Riordan should find that, by the appropriate standards of the time, and despite some instances when the behaviour of the company fell short of perfection, "JTI-Macdonald's conduct was overwhelmingly above reproach." Mr. Pratte said that the plaintiffs legal theories were "all designed to get rid of awareness and personal responsibility and leave as the only relevant variable the evil tobacco companies." 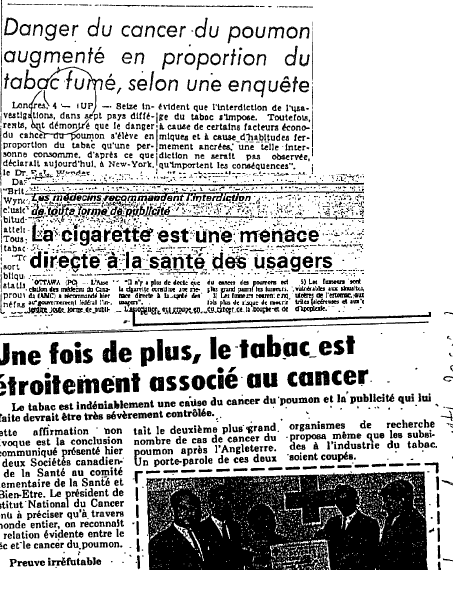 Those representing Quebec smokers had "transmogrified" the law to get around "the inconvenient truth that smokers knew all along that smoking could kill them." Fin de non-recevoir, risk/utility, reverse burden -- these were all principles that Mr. Pratte considers to have been improperly applied by the plaintiffs, or which did not belong at all in Quebec courts. Many long minutes were devoted to explaining exactly why. Mr. Pratte contested the population-wide/epidemiological logic of the plaintiff's case. Legal causation, he said, could only be established individually. Before establishing that a smoker was entitled to compensation, the court would have to establish whether that individual had suffered any harm (prejudice), if that injury was linked to the conduct of his client. Even then, it would also be necessary to establish the time frame, as the laws had changed over the trial period (and the life of the smoker). "The causation question is the 'ninth question' in this trial," he said. "How are you going to link what happens to an individual?" He pointed to other tobacco class actions that had been refused certification (Caputo) or decertified (Engle) and said this was because the unique circumstances of each smoker made a collective award improper. The plaintiffs had explained their decision to not call any class members to testify because they would not be representative, Mr. Pratte said. "You can't have it both ways" said Mr. Pratte. If they are considered identical with respect to causation, then they should be representative of all. No need to warn. No duty to warn. No barriers to government warnings. Mr. Pratte spoke repeatedly of the overwhelming level of knowledge about the harms of smoking throughout the class period. It was this knowledge that absolved the company from any duty to provide additional information. "Duty to warn is not absolute: it is related to what people knew or could have known." Moreover, the "duty to warn does not extend to the duty to make people believe." He mocked the warning that the plaintiffs had proposed as closer to adequate. The plaintiffs had no evidence to support this approach, and had (twice!) altered it during their arguments last month, he pointed out. Moreover, the caution that "many can never quit" was contradicted by the messages provided by government (and the plaintiffs' expert on addiction). And the lead "do not use this product" was an invitation to those who smoked because they were rebellious. Cigarette warnings had been in place since 1972 as a result of "persuasive regulation" or "legislative regulation", Mr. Pratte explained. There was never anything blocking the government from requiring stronger warnings on cigarettes, he said. The plaintiffs had the opportunity to question Health Canada witnesses - or to call for additional witnesses - to testify whether they had been hoodwinked by the industry about health effects or "taken to the cleaners." He held up a pack with the new government warnings. "Can anyone say that these risks are not enough? It can't possibly be argued that they are not adequate." The fact that people continued to smoke with the new warnings in place demonstrated that warnings would not have made a difference. "There is no evidence that it would have made a difference for individuals. There is evidence that for the strongest warning possible, people still smoke." The government plays a big role in JTI's defence. It is referred to on an average of once a page in their written arguments, and was an echo over the day. Mr. Pratte alluded not only to what the government had done (require warnings) but also what it had not done (require more of the companies or file charges of its own under the Consumer Protection Act). He stressed that governments - federal and provincial - had made the decision to allow cigarettes to be sold, and that a ruling to support the plaintiffs' view that the sale of cigarettes should be a fault would "overrule what the authorities have explicitly, consciously, knowingly, permitted." Mr. Pratte acknowledged openly that cigarettes hurt people. "Smoking is a stupid decision. A lot of people think the same about drinking, car racing, parachuting, hunting." but "Government has not only allowed it to happen, it has regulated it and explicitly permitted it to happen." Perhaps there will be a time when legislators will decide that cigarettes are so bad that [they should not be sold but] until that happens, that is not the state of the law that you must apply." Mr. Pratte introduced a number of temporal challenges for Justice Riordan. He insisted that the conduct of the companies be judged on the standards of the time -- and said that the lack of complaints about company behaviour suggested that there was no misconduct. He punctuated the timeline of the class period with the years when the Consumer Protection Act came into force, when the different warnings were implemented, when advertisements were in place. He syncopated that timeline against the likely smoking history of members of the class. ("People who were sick in 1995 probably got sick as a result of smoking before 1980 (when the Consumer Protection Act came into force)." He used the mashed up result as further justification for individual trials before any damages could be justified and a reason why punitive damages could not be assessed. I am sure I was not the only one who noticed Justice Riordan's steady gaze over the day, and wondered about his response to Mr. Pratte's very detailed explanations. More intriguing yet were the questions that Justice Riordan put to Mr. Pratte, and the unexpectedly indirect responses. In the morning, when asked a hypothetical question regarding the possibility that the companies might have had superior knowledge that health warnings were inadequate - Mr. Pratte sidestepped the question. (Twice!). In the afternoon, a similar dynamic began when Justice Riordan asked Mr. Pratte whether the lung cancer suffered by some members of the Blais case was not evidence of injury ("prejudice"). Mr. Pratte seemed reluctant to make this admission but, when pressed, agreed. Tomorrow, Mr. Pratte continues to present JTI-Macdonald's closing defence. The topics covered will be when the harms of smoking were known and what the companies said about them. Day 242: The "Obedient Regulatee"
This is not a commission of inquiry. This is not a trial to determine whether a certain government policy was right or wrong. This is a civil liability trial. The plaintiffs had a burden to prove three essential elements [fault-damages-causation]. They didn't do it. They admit they didn't do it. They are asking for presumptions to get them over that burden. But the presumptions are so novel, so far reaching, so wrong, so unpermitted by law or the civil code... that cannot be allowed. The plaintiffs are asking this court to issue a judgment that would be full of error. [The judgment in this case] should say that people lived through hard, difficult, socially complex problems during those years and that RBH dealt responsibly with them." It did not take even the morning for Simon Potter, counsel to Rothmans, Benson and Hedges, to complete his final arguments to Justice Riordan. With a heavy emphasis on the law and a very light touch on the questions that were the focus of two years' evidence-gathering, he seemed focused on knocking the legal pillars out from under the plaintiff's case. He began by listing the presumptions that he feels Justice Riordan has improperly been asked to make when deciding if Quebec smokers became addicted or ill as a result of his client's actions. First among these was the idea that people would not voluntarily harm their health. This, he said, was "manifestly false." 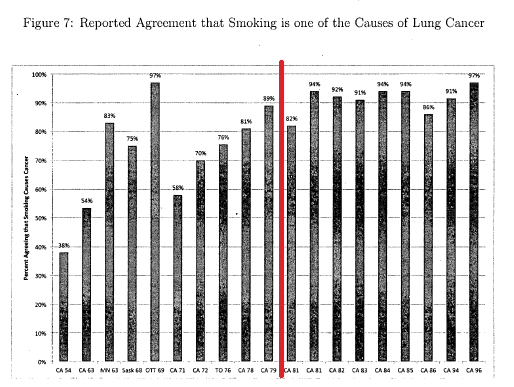 Proof lay in the fact that people "still chose to start" smoking even decades after warnings appeared on package and a "tidal wave" of information about the risks of smoking hit the public. Cigarettes were no more harmful than people should expect. Like other risky products (he again mentioned motorcycles) people "make their choices". When the risk materializes, "they don't get to come and sue people on the fact that this is an erroneous choice." He said it was not plausible to presume that no smoker ever had full knowledge of the risks, or that they had not smoked just because they liked it. People's understanding of the risks of smoking was diminished because there were plentiful and positive images of smoking in cigarette advertisements, the plaintiffs have claimed. Simon Potter today turned this argument on its head. He used the same logic to say that the effect of advertisements was diminished in the "context of the tidal wave of health information" provided to the public. For that reason, Justice Riordan could not presume that any typical member of the public would have believed any misleading cigarette ads. Mr. Potter seems to recall a more energetic health effort than is held in my memory. He said today that the message about the harms of smoking was "reinforced by every visit to every doctor. Every time you turn on the TV practically, the government was telling you not to smoke." Mr. Potter identifies several reasons why Justice Riordan should not/could not make any award for "punitive" damages. He said that because the two laws that provide for these awards (The Consumer Protection Act and the Quebec Charter of Human Rights and Freedoms) were not adopted until mid-way through the class period, any actions of the companies before the mid 1970s were not relevant to assessment of punitive damages. He said that the behaviour of the companies had changed, and that further deterrence was not required. He displayed a check-list of contentious marketing behaviour that was no longer in place: an end to lifestyle advertising, to displays at retail, the placement of large warnings. He cited the search and seizure powers under the federal Tobacco Act as deterrence enough. He said punitive damages cannot be awarded until compensatory damages are calculated -- a calculation Mr. Potter feels cannot be done under the current circumstances. Punitive damages are time-limited (the term used in Quebec is "prescribed"). The Quebec law that removed the limitation period for this class action did so only for compensatory and not for punitive damages. The industry challenge to this law is not yet resolved. In addition to these legal issues, Mr. Potter said there would be no justification for punitive damages, given that his client had never acted with maliciousness or intent to harm. "These things cannot be found in the context in which my client is the regulate - is actually doing the government's policy by putting the warnings on the package which the government approved"
Justice Riordan suggested to Mr. Potter that past behaviour might be relevant ( "The gravity of a debtor's fault [is] grounded in the longevity of the action"). He also raised the view that punitive damages serve to discourage bad behaviour by other people. In reply, Mr. Potter appealed to the plaintiffs' description of cigarettes as a unique product, unlike no other. Unless, of course, the "mere sale" of cigarettes is to be deterred. The plaintiff's request that Justice Riordan should rule that the sale of cigarettes is a "fault" under Quebec law seems pretty big stuff to me, but it has curiously received only minor air-play in the final arguments so far. Today Simon Potter made a few tangential reference to this big-ticket item. In one, he acknowledged that this was the one activity where company behaviour had not changed. "It is impossible to conclude that deterrence is needed, except if the court agrees that the mere sale is to be deterred. That is the only thing that is happening now which was happening before..."
Several times this week, Mr. Potter has pointed to a slide showing a reduction in the percentage of Canadian men and women who smoke from 1965 to 2012. In Mr. Potter's view, this graph establishes that the actions of the company (through advertising, the introduction of light brands, comments to the public, etc) have had no impact. Otherwise, he suggests, the slope would have been different. This, he says, is proof that the "government strategy worked - there has been a gradual disappearance." Disappearance? "Now smoking is less than 20% of the adult population." Well, only 1 in 5, anyway. Justice Riordan has challenged Mr. Potter on many of his claims, but not on this one. Left standing was the idea that this historic trend did not show the footprint of the industry's actions. There has been no suggestion that this is not a very robust way to conclude impact, or that the slope might have been steeper if the companies had acted differently. I have learned a few things during this trial: those who sit in front of the bar are very very smart, but when it comes to numbers and graphs, they are vulnerable to being bamboozled. It took less than an hour for Mr. Potter to give his answers to the common questions that were laid down for the trial when it was authorized, and which formed the structure for the written arguments. He prefaced his comments by repeating that the issues covered by this evidence don't prove a connection between any individual's circumstances and the behaviour of the companies. He urged the judge to see RBH's actions in an historical context, and again stressed the role of the government. "In the real world context of these decades... the court should come to the conclusion that my client handled those years and that context, with a great deal of responsibility - with a great deal of aplomb and a great deal of deference to the government which was certainly the lead actor in all of what happened." Did RBH manufacture a product dangerous and harmful to its consumers? Yes But this only had legal significance "if the product delivers a GREATER danger than what consumers were entitled to expect in all the circumstances." Only on this question did he highlight much evidence - cycling through a dozen or more moments when the harms of cigarettes were acknowledged by governments and others. Among these were the one-time 1958 advertising campaign by Rothmans. Did RBH know of the risks and dangers? Yes. This followed on from the answer to the first question. Did RBH put on the market a product that causes dependence, and not take steps to make it less addictive? Yes. As those words dependence and addiction are used in common parlance, they sold cigarettes that for some were hard to quit and in part because of nicotine, yes. That doe not mean that smokers could not stop, or that they lost autonomy. As to the nicotine levels in cigarettes, these had never been controlled by RBH, there had been no work to make cigarettes compensatable, and the company had at all times deferred to the government's directions in cigarette design, such as low-tar cigarettes. Did RBH trivialize the harms of smoking? No. The company left public comments about the harms of smoking to others. "They consciously allowed the monopoly of the anti-cigarette message to be as dire as it could be." Did RBH market its products in misleading ways? No. "There is no evidence of such a strategy or implementation.No campaign of misinformation. No evidence that anything of the sort ever reached a consumer." Mr. Potter rebutted the charge made by the plaintiffs last week that an ad of a roller coaster ride might have been designed to reach young people as young people went to amusement parks. "The Court has no evidence about attendance at ausement parks in 1973," said Mr Potter. "I took my kids there - I saw lots of other parents there too." Did RBH conspire to impede people knowing about the harms of smoking. No. The CTMC was a legitimate trade association, which served to facilitate communication between the companies and the government. Did RBH interfere with the right to life, security and inviolability of class members? No. "RBH throughout this piece was licensed, was a responsible licensee, was selling a legal product in a legal way and was doing so as either a real or an effective regulatee [of government]. The trial resumes on October 20 when JTI-Macdonald presents its final arguments. An updated calendar of these final weeks can be found at the bottom of this post. Today was the day that the defendant tobacco companies began to present their final arguments in the Montreal tobacco trials. First up was Simon Potter, who represents Rothmans, Benson & Hedges (RBH), which is the Canadian subsidiary of Philip Morris International. Again the unusually large crowd of onlookers created a sense of occasion. This time it was only the industry's side of the room that was full -- ah, but with a much more expensively-dressed audience than had turned out to watch the opening of the plaintiff's case two weeks ago! Simon Potter is not the only lawyer representing RBH, but reading the trial transcripts one might be lulled into thinking this is the case. His colleagues from the firm McCarthy-Tétrault ( Pierre-Jerome Bouchard, Kristian Brabender, Adam Klevinas, and Jean Francois Lehoux) are rarely given a speaking part in this theatre. Even the recently arrived Michael Feder (from their Vancouver office) is made to look as though he has only a walk-on role. Today he got to run the powerpoint slides. I mention this because RBH is the only team in this long long trial to rely on one voice, one style, one relationship with the judge. I have often wondered why the world's largest tobacco company has its legal eggs in this one basket. Mr. Potter is not only the most flamboyant lawyer in the room, he is the most flamboyant orator I have seen since newsreels began to be shown in Technicolour. For someone, like myself, who is not familiar with the legal principles being discussed, this has some advantages. The rhetorical flourishes that ornament his points make them harder to miss. I appreciate the extra time to let ideas sink in. It does, however, demand a different kind of patience on the part of the listener. Today there were signs of listener-fatigue. Usually it is the lawyers who call the time to break for coffee or lunch: today it was Justice Riordan who blew the whistle. On the other hand, Mr. Potter will be making the shortest arguments of any of the three defendant teams. Originally provided with 4 days to present his views, he announced today that his comments would take only 2 days and would be finished tomorrow. The central theme to Mr. Potter's arguments today was that the plaintiffs had failed to prove their case. They had not proven that any actions were wrong, or that they could be linked to any damages of any individual. They had not proven their case for any one member of their class, and they had certainly not done it for the other million. "Plaintiffs had a burden as all plaintiffs do to prove a fault, to prove injury and to prove a causal connection and to do that for every one of the class members...There is no evidence as to what actually happened or as to what class members actually did as a result of anything the defendants did." Mr. Potter cited higher court rulings that class action plaintiffs had to meet the burden of establishing damages experienced by each member of the class, and also link those damages to the defendants' actions. "This burden does not change just because the plaintiffs sue on behalf of a million people. Or because they cover a period of 50 or 60 years." He said this had not happened. "The eight common questions [set down for the trial when it was authorized to proceed as a class action] do not go to injury. They don't go to causation. They don't go to damages or quantification of damages. Not Judge Jasmin [who authorized the class actions] and nobody else has identified any commonality in those issues." As a result, he could win even if he could not show that his client was innocent of the claims against it. "To win this case I only need the court to conclude that the plaintiffs have not proven that every class member has a valid claim." He cautioned that to do otherwise would mean that some people would receive money from the claim who really were not eligible. Among these would be smokers who were not addicted and who liked smoking as well as ex-smokers who became ill even though they had quit so long ago that their increased risk of disease related to smoking had been reduced. He mocked the idea of using statistics to determine eligibility in a claim. He suggested that the "more than 50%" probability that was used by the plaintiffs' epidemiologist (Jack Siemiatycki) to attribute disease to risk was akin to deciding that if 51% of the occupants of a room were men, then one would conclude, on the basis of an average, that everyone was a man. (Okay, I may have misstated this. It was a head-scratching moment). With these safeguards, he said, the Létourneau (addiction case) was a "money for smoking" case. "I am a smoker - give me money." The Blais (disease) case he similarly characterized as a "money for being a sick smoker" case. Smokers were warned. They knew of the risks. Mr. Potter refuted the allegation that his company failed to give adequate warning. He said that a "sizeable portion [of the classes] has never smoked cigarettes without packages having an explicit government-approved warning." Only someone who stopped smoking in 1972 could be said to have not seen a warning each and every time they smoked, he said. Mr. Potter said several times that smokers "overestimated" the risks of smoking. He bases this claim on evidence given by Kip Viscusi. Because the plaintiffs originally planned to call Paul Slovic to rebut this, but ended up not doing so, Mr. Potter says that Justice Riordan should draw a "negative inference" and see this as "uncontradicted"evidence. Even then, he said, the product warning could not be considered insufficient just because it did not dissuade people from using cigarettes. He cited motorcycles as another product which has risks associated with it, but which people chose to use anyway. According to Mr. Potter, cigarettes were no less safe than people expected. "There is no proof that cigarettes offered less than the safety one could expect. There's no safety defect. It's a cigarette." I wondered what I was supposed to understand from the dramatic pause he placed between each word: It's. A. Cigarette. The plaintiffs have argued that the dangerous nature of cigarettes means that they should be sold with liability attached. Mr. Potter said that this would go against the express policy of government. "Risk utility argument flies in the face of ...government decisions made since the first decade of the last century not to ban cigarettes, but to allow, with licensing, the manufacture and sale of cigarettes." The fact that cigarettes are a "product you are licensed to make" is a "core policy of government." He pointed to the recent federal law, The Consumer Product Safety Act, and its predecessor, the Hazardous Products Act, as evidence that the government did not want tobacco products treated like other consumer goods. Both acts have statutory exemptions for cigarette products. This was no casual decision, he said. "Health and Welfare Canada had hundreds and hundreds of employees making this policy." Mr. Potter stressed that he was not arguing that cigarettes are not harmful, nor that there had been no occasional wrongdoing or poor thinking at the companies. Nonetheless, he thought the judge should rule that "RBH acted as a responsible player." He defended the industry witnesses who had appeared at the trial as "honest people trying to do an honest job in a difficult, complex circumstance." Given his own part in the story, and the controversy that has simmered over his involvement in the destruction of documents when he represented BAT/Imperial Tobacco, it sounded a little like a plea for clemency. The harmfulness of smoking has been known for "two turns of the century" he said, pointing to the century's old use of terms like "coffin nails" and "cancer sticks" "Is there any other product which has common parlance indicating such a universal recognition of serious danger?" He said that Rothmans had acknowledged the risks in its 1958 advertisements, and that subsequently the "essential nugget" of health information - the more you smoke the greater your risk - had been communicated in health warnings and other information. Similarly, people have known for decades that "smoking was going to be hard to quit." If the company did not use the term "addiction" it was only because health authorities didn't either. He appealed to the views expressed at the trial by [former associate deputy minister and subsequently tobacco industry consultant] Bert Liston that using the term "addiction" was neither scientific nor helpful. He said it was "not a wrong to decide that we don't want to call smokers by a name that has all that baggage or that conveys the idea that it is harder to quit than it is." Pointing to the volume of government press releases and other material, Mr. Potter said that the sale of low-tar brands was entirely at the feet of government, said Mr. Potter. They were "not a wrong - they were compliance." Terms like "light" and "mild" were used appropriately. "If I have a brand that tastes more mild, I am going to call it mild." These products caused no additional harm. "There is no evidence that anyone thought a low tar cigarette was safe." They did not affect the number of people who smoked - as his "Nobel-laureate" expert witness James Heckman had testified. (The Nobel prize winning bit was repeated a few times in the afternoon: no chance of it being overlooked!). Mr. Potter challenged the idea that cigarettes were not "safer" than they had previously been. "No reasonable commentator - let alone witness -- let alone evidence - says that the right thing to do is to go back to cigarettes as they were in 1950s." Other times they poked at the Mr. Potter's logic. Was his argument that the civil code did not require an admission of causation in warnings not also an argument that warnings should be issued before causation is admitted? What of his representation of relative risk as an arithmetic average? But mostly it is hard to tell from the bleachers how this trial is going for any of the participants. These folks would all do well at poker. Tomorrow Mr. Potter is expected to finish presenting RBH's defence.